After 3 years of planning, today we are here! We are Funtails!!! We make boardgames! And we love them. It was back in 2011, when Steffen Rühl, co-founder of Funtails, and Matthias Cramer met at a yearly prototyping workshop. 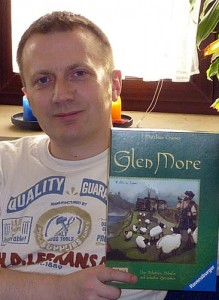 At the time, Steffen’s favorite game (and luckily, also that of his wife Jutta) was Glen More. In the following years, Matthias and Steffen worked on several projects and decided in 2016 that they would work on making Glen More 2: Chronicles. They decided to make a sequel that would stand on its own, not just a reprint of Glen More. A game that would be a worthy addition to any board game shelf, no matter if the original Glen More sat next to Glen More II: Chronicles in the shelf, or not. To reach this goal, the sequel will feature one third of what the fans of Glen More love about the original game, one third gameplay improvements and tweaks and one third exciting new additions. In the coming weeks we will tell you all the details about what is new, what is improved and what we kept from the original Glen More. You will meet the team, look over Matthias’ shoulder when developing and read about how the game develops. Simply register for the newsletter to stay informed! We’re glad you’re with us. 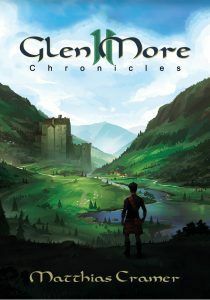 Glen More II: Chronicles will be with you in 2019. Thanks a lot for your visit! Metal Coins… we will see what we can do. We will calculate material prices in the coming weeks. Would an optional add-on purchase be okay as well to keep it optional? I enjoy having the opportunity to freshen it up with Matthias and testing it. We had quite a few public tests and very positive feedback. So I am sure we will have something you can look forward to. There will be a public test announced (at the warm-up day on Wed) before Essen SPIEL. So excited by the movement on this! To make really good and qualitative games really means something to us, so we’re gonna give everything.